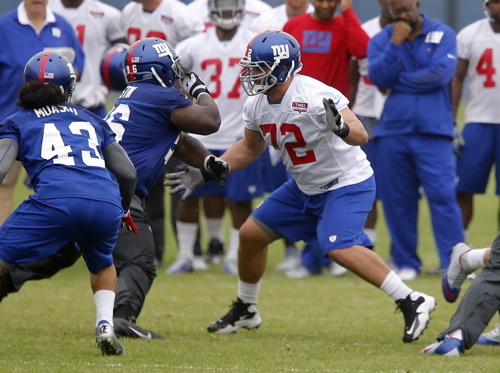 Justin Pugh and Ryan Nassib Sign: All of the Giants’ 2013 NFL Draft class is now signed. The Giants announced on Thursday that OL Justin Pugh (1st round) and QB Ryan Nassib (4th round) have signed. Pugh’s contract is reportedly a 4-year, $8.34 million deal. Veterans and rookies are required to report to training camp on Friday. Practices begin on Saturday at the Giants’ practice facilities at the MetLife Sports Complex. For a complete schedule and Giants.com Q&A guide, see the Training Camp section of the website. Giants Change Name of Headquarters and Training Facility: The Giants announced on Thursday that the sponsorship of their headquarters and training facility at the MetLife Sports Complex has changed. Timex will no longer be the sponsor but Quest Diagnostics. The new name of the headquarters and training facility is the Quest Diagnostics Training Center. John Mara Likes This Team’s Potential: Giants’ President and CEO John Mara said on Thursday that he like’s the 2013 Giants’ potential. “We signed a lot of players,” said Mara. “We have a lot of guys on one-year deals who have a chance to reinvent themselves and reestablish their careers and they’re going to be highly motivated, and I think we filled in some needs for ourselves. I think we had a good draft. So yeah, I’m excited about it. I think we have a very solid organization, a very solid team. Hopefully we’ll stay healthy, and I think we can be as good as anybody. “I look at us on paper and I think we’re every bit as good as that team, but there’s a long way to go between the paper and proving it on the field. But we have enough talent to compete with anybody. “We obviously have a quarterback in place who has won a couple of Super Bowls, who is in his prime. But he needs a little bit of help and we need to play better on defense and we need to play better up front and we think we’ve added some pieces that are going to allow us to do that. But I don’t look at it like our window is closing and we better do something now. We’re never going to change how we operate. We still focus on the draft and on adding free agents, be it short term or long term, that are going to help us. Perry Fewell Talks About the Defense: Defensive Coordinator Perry Fewell talks about the defense in an exclusive interview with Giants.com. Joe Skiba Takes Us Behind the Scenes: Giants’ Equipment Director Joe Skiba takes us behind the scenes at Giants.com.